The first animal is charged at £54.64 + VAT (£65.57) and each extra one at £25.62 + VAT (£30.74). Certificates are charged extra, costing £12.16 + VAT (£14.59) each for individual certificates and £24.32 + VAT (£29.18) for a litter certificate with all results of that litter recorded on a single sheet. This is testing a single young animal that you think might be deaf or, especially in a breed susceptible to genetic deafness, to show that both ears are normal prior to breeding. 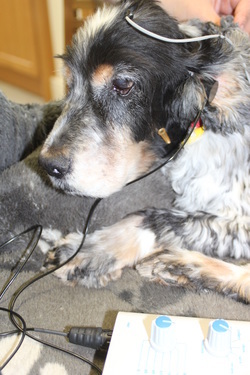 Testing of animals suspected to actually be deaf is usually much more complex. More data gathering and analysis is needed to reach a diagnosis and can take much longer - typically more than an hour. It is also necessary to write a report to be sent to your veterinary surgeon. These animals too should ideally be starved for 4 - 8 hours prior to the test to avoid vomiting if sedation is necessary. These animals usually require sedation unless they are very compliant. Dermatology/neurology case - consultation, BAER testing and report £444.47 including VAT. Sedation if necessary is extra. Payment is required at the time of the test. a time mutually convenient for a veterinary practice, their patient and VHS - an individual price quotation is necessary please contact david@davidgodfreydermatology.co.uk but this is based on the above prices plus travel expenses plus VAT.